Sunday September 14 2008 marked the annual rememberance services for the Battle of Britain. In Blenheim this was, as most war rememberances are, held in front of the memorial clock tower in Seymour Sqaure, central Blenheim. A flyover was staged at 11am to commence the service. This was carried out by dH82A Tiger Moth ZK-BER c/n844 owned by a local Omaka based syndicate. On the subject of Convair's there are only 5 on the Australian register all with Pionair, 3 are Convair 340/580s and 2 are 440/580s. New Zealand has a large population of Convairs operated by Air Freight New Zealand and Air Chathams. There are 3x 340/580s, 1x 340/5800, and 5x 440/580s. 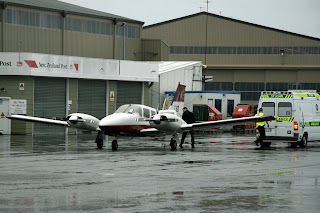 Air Chathams operate 4 of the 440/580s while AFNZ operate the rest. 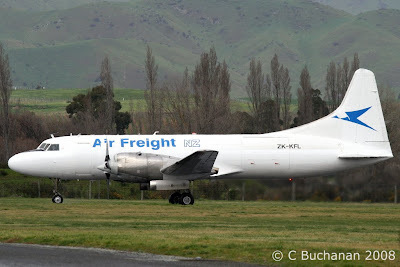 Air Freight New Zealand is progressivly repainting its fleet of Convairs into its slightly modified colour scheme. This involves removing the red and blue cheat lines, and slightly tweaking the look of the titles and the logo on the tail. The old scheme is seen below on ZK-KFH with the new scheme seen on ZK-KFL. I personally think the new scheme is too dull and boring - what are the thoughts of others out there, please feel free to leave a comment with your thoughts on the change. Also noted was Qantas/Jetconnect Boeing 737-376 ZK-JNB which was on the scheduled QF2791 AKL-ZQN. This flight diverted to Invercargill with the return leg (QF2792 ZQN-AKL) cancelled. JNB then operated IVC-AKL as QF6172. 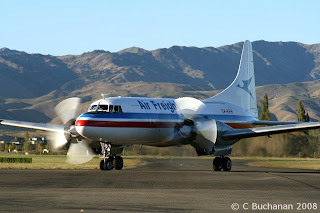 As mentioned in previous blogs the only remaining Safe Air Bristol B170 Freighter in Marlborough ZK-CPT (seen above) has been given a new lease of life. For several months the spearhead of the project, Al Marshall has been fighting with a very reluctant and seized starboard engine. Over the weekend he finally got that problem fixed and the engine is now running smoothly. This enabled both engines to be run together on Sunday evening. CPT is now the only running Bristol Freighter in the world. Friends of the Bristol plan on public running events every two months until Easter. There are a few of us that are also keen for a night run that should show off the effect of 28 short straight exhausts. The cowls for a good metre or so behind the exhausts are steel so I imagine the flames should be quite impressive. There is a certain rpm that the Hercules have a very distinctive note that is quite unexpected from a twin row radial. It is almost a brrrrp, brrrrp, brrrrp type sound that that almost sounds comical when they are both doing it together. 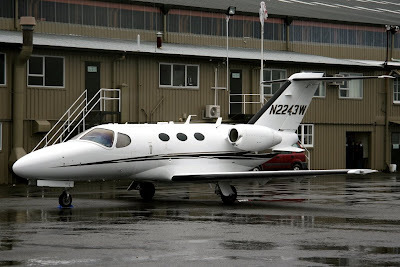 I will try and quantify the cost of a ground run so that they might happen on demand from interested groups. The AHC has the odd tourbus load go through the museum and if enough interest is shown by those visitors, they can have a fully 'interactive' visit to Omaka.